Martin McAndrew joined the BSc Honours Veterinary Nursing Degree programme at Edinburgh Napier University (in collaboration with The College of Animal Welfare) in 2012. We caught up with Martin and asked him to share some of his experiences about his time at College. Currently I am undertaking my fourth and final year of the BSc (Hons) Veterinary Nursing programme. Since before I can remember, I have always had an interest in animals; having been brought up around pets that belonged to relatives and having owned pets myself, I knew that I wanted to go down a career path that involved the care and welfare of small animals. Throughout my time at high school, I focused on my studies in order to achieve the grades that I would need in order to gain a place at university to become a veterinary surgeon. Towards the end of high school, I did not achieve the grades that I needed to start the veterinary surgeon training. Despite this, I applied to Elmwood college to do animal care; starting on the NC level, working my way up towards the HND course. 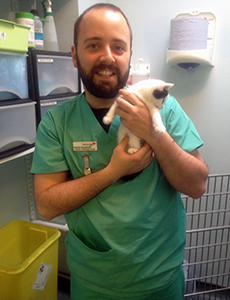 During my time at college, I had the opportunity to observe the work of the veterinary team at St Clair’s Veterinary Hospital and volunteered at a boarding kennels as part of my work experience. Through both the theory and practical work; along with the work experience, this allowed me to make a decision with regards to what I wanted to study once I left college. Although I admire the work of a veterinary surgeon, I felt that I wanted to go down the career path of the veterinary nurse; being closer to patients and providing them with round the clock care. When applying for the veterinary nursing course at Napier University, I was completely aware that the veterinary nursing profession was known to be female dominated. Despite this, I did not think twice about applying. Once I had been accepted onto the course, I was aware that I may have been the only male student in my year; although I found out during my induction what I was one of two male students in the class. During my first year I had not realised that the veterinary nursing profession had only been around for a few decades. Throughout the first year I realised how important it was for us, as a class, to help in making the nursing profession more common in the veterinary world. From being in practice placement over the past thee years, I have aimed to show veterinary staff and clients that the veterinary nursing profession can accommodate to both genders as it does in human nursing. I have most enjoyed the practical work; including the practice placement modules. Using what I have learned, I enjoy providing care to patients when I am in practice placement. Through assistance and guidance from veterinary staff, I have a much better understanding of the treatment and care that patients require; whether they be in for surgery or as emergency cases. One of the parts that I have found most challenging is the OSCE practical exams. With each OSCE exam that I have undertaken I have always had nerves when showing examiners how to do various nursing tasks that are carried out every day in the veterinary practice. Although I had many opportunities to practice through practical sessions at college and from being in practice placement; I felt easily under pressure when being timed and making sure not to make any mistakes when carrying out each task under exam condition; plus, it can be very challenging when applying nursing care to a soft toy animal. Despite having had to undertake OSCE resit examinations in the past, I have always come back and improved during second attempts. From these OSCEs, I have learned how important it is to be as quick and efficient as possible when dealing with patients that require immediate care and how important it is not to make mistakes; especially in a case where a patient’s life could be compromised. When finding out about the honours degree course when I was still at college, I knew straight away that I wanted to apply to Edinburgh Napier University and work my way through each year and eventually achieve the BSc Honours in Veterinary Nursing degree. With an honours degree, I feel that this will open many job opportunities for me. Having a good name and being in my locality enabled me to study from home, rather than living away from home; this allowed me to focus on my studies and feel less distracted. But I also enjoyed Edinburgh nightlife that comes with being a student. At the moment I plan to apply for a job at my practice placement at Inglis Veterinary Hospital in Dunfermline. Once I have worked there for a year or so; depending on the requirements, I hope to undertake a hydrotherapy course. Having worked with the hydrotherapy team in Dunfermline, I find this a very interesting area of nursing and animal care to get involved in, in the future. Other areas of practice that I have also taken an interest in are canine behaviour and nutrition. When I achieve my honours degree, I will feel that I have come a long way, spent a lot of time studying and learning. There has been a few ups and downs; but I got to my final, in the end. And because of this, I am pleased that I stuck in there. For those wanting to do the course, I advise that they go ahead and apply. From completing three years of the course, I have really enjoyed my time at Napier. For those that are looking to do the course, I will tell them that it is vital that you keep your head down and work as hard as you can. The workload can be pretty hard going but if you keep up the work and learn what is being taught in classes, you can still have fun as a student.